My husband and I recently took a week long vacation to Charleston, South Carolina. Last summer, you may recall that we visited the Hilton Head area of South Carolina and I was taken aback a bit by the excessively hot and humid weather. Well, that was nothing compared to the humidity on this trip! 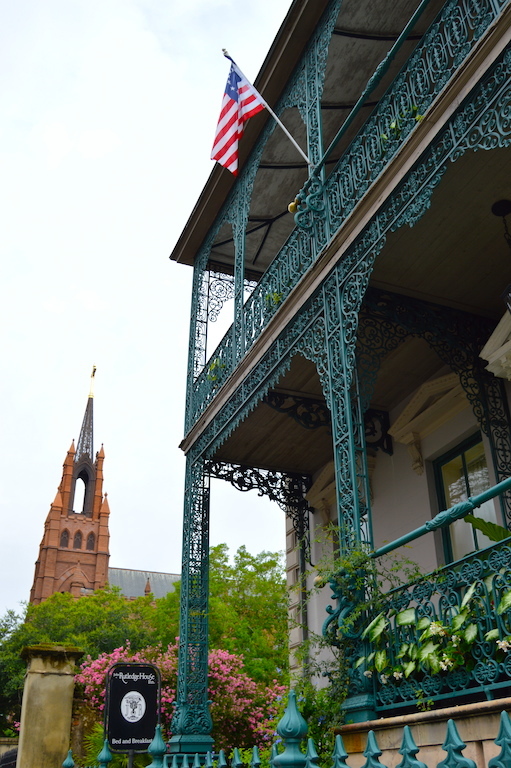 Let me give you a sense of how humid it was in Charleston: when we went outside of our bed and breakfast the morning these pictures were taken, my sunglasses and camera lens completely fogged up! It was a miracle that we were able to take these pictures, because the first photos had this eerie, ghostlike appearance due to the excessive moisture on the lens until we wiped it off before every single shot! Instead of focusing on the negativity of the humidity and literally being covered in sweat after just a few minutes outside, I'll instead turn to the positives, of which there are many because Charleston is a gorgeous city! One of my favorite things about our trip were all the historic homes and buildings that line the city streets and the fact that so much important American history happened there. 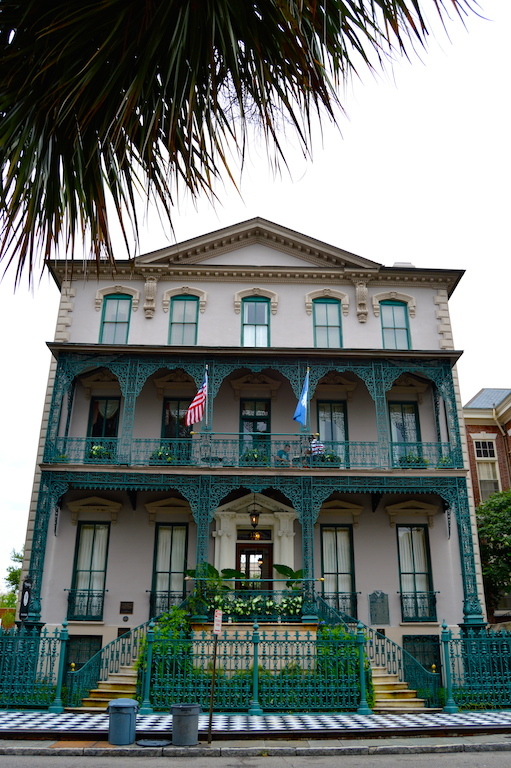 We actually stayed in one such home, the John Rutledge Inn, which is a gorgeous bed and breakfast located in the center of the historic district of Charleston. The pictures I am posting here were taken outside of the house, which was built in 1763. For those of you who are history buffs, the original owner of the house, you guessed it, John Rutledge, was a signer of the U.S. Constitution, the first governor of South Carolina, and the second Chief Justice of the U.S. Supreme Court. 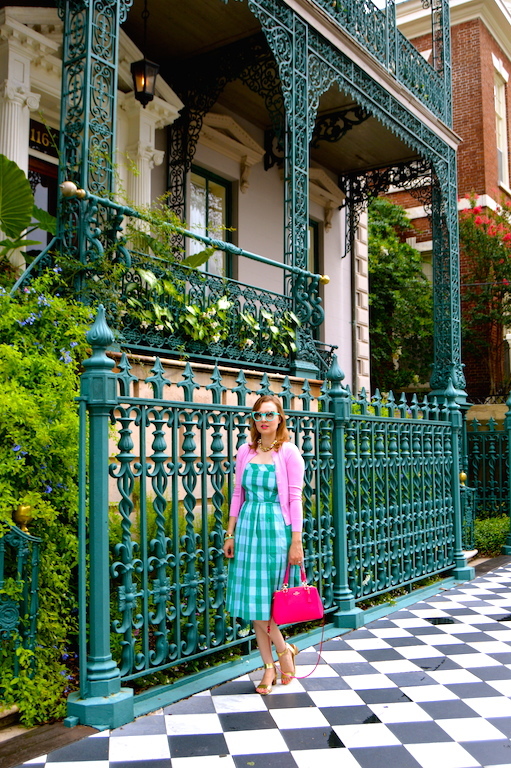 As you can see, my gingham dress was a perfect match for the green ironwork that is a distinguishing feature of the house. I also was enamored with the black and white marble sidewalk in front of the house. 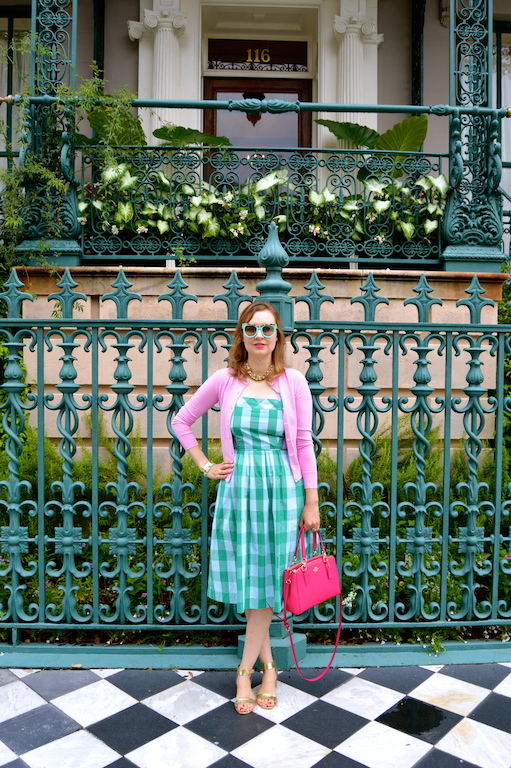 In addition to my gingham dress, you might also notice that I have a pink cardigan on, but that didn't last too long, given the aforementioned weather! I thought it might be handy for going in and out of restaurants and stores with the air conditioning blasting, but I thought wrong. I need to learn to pack more carefully next time I head to the South! 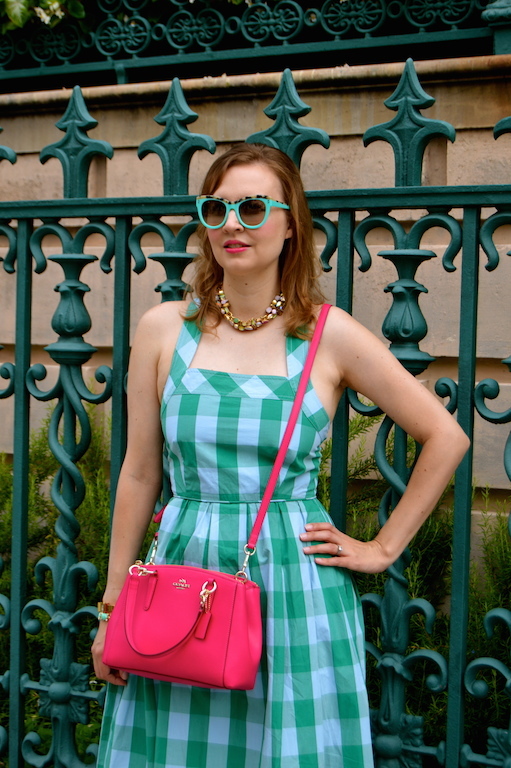 what i wore, Jersey Girl, Texan Heart, Style Me Wednesday, Oh, Hey Girl! This sounds like the weather we are having here currently and what it was like in New Orleans when we visited. It's like having a hot towel thrown in your face. You however, are coping beautifully in this stunning outfit! I LOVE it! I have now added South Carolina to the list of places I want to visit. Hope you had a brilliant time. Charleston looks so gorgeous! I love that dress! Beautiful colors... and the place looks amazing. I've never been to Charleston but have always wanted to go! 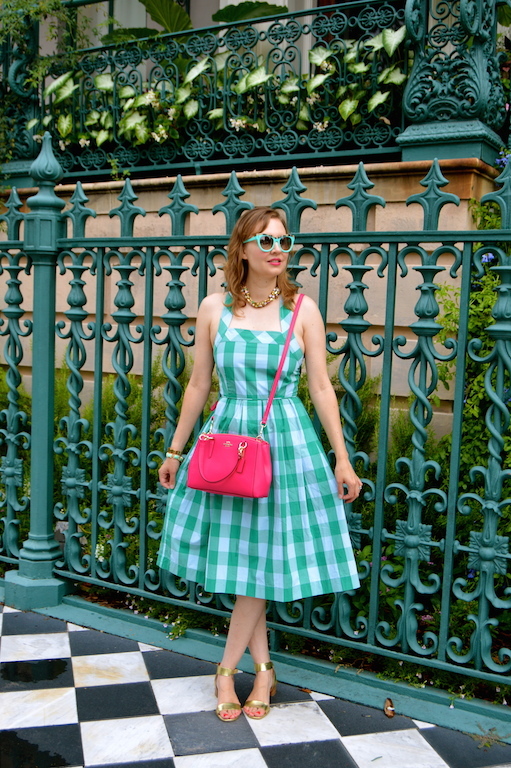 Although we get plenty of heat and humidity here in the summertime so maybe I'll pick a different time to go :) I love the gingham dress--it has a bit of a southern feel, so it's perfect for your location! I've never been to Charleston, but I imagine that dress would be perfect there! Beautiful pictures! That dress is perfect for the South! And Summertime down South is horrendous! Only light dresses! I lived in Florida for 10 years and it was brutal! What a cute gingham dress, Katie! 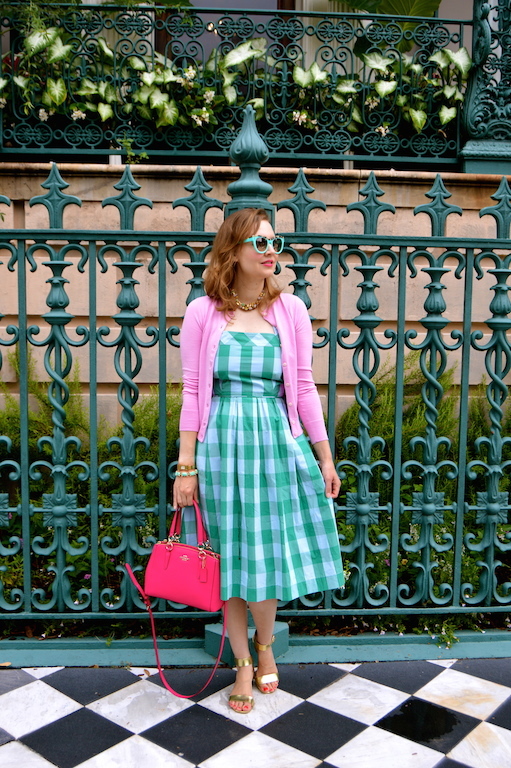 I have a blue gingham dress on the way too, and so excited to style it! That dress is so pretty and has a retro feel to it. The retro glasses match it perfectly in color and style and that is one charming city I want to visit one day. Your entire outfit is perfect for the South. I want to visit you and your closet one day! 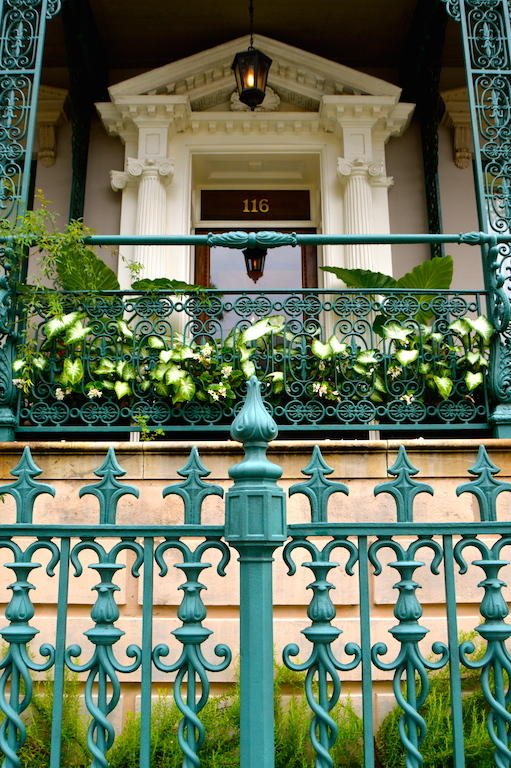 Enjoy the weekend pretty lady and welcome by to linkup this week. Thanks and it was nice catching up! <3 Ada. It's on my list to visit Charleston one of these days. Your outfit is stunning, I am so bummed I missed out on this dress.